Resistance bands are widely used for general strength training, workouts, general conditioning to supplement gym sessions and in some cases replace them. Resistance bands exercises are also very popular for rehabilitation exercises and for or injury prevention, especially for older people. Resistance band exercises routines are a wonderful way to exercise at home or outdoors on your balcony, in your backyard or the local park, or inside in one of your rooms (little space is required). Such exercises can even be done while watching TV. There are also ideal for family exercise routines. These exercises can easily be integrated with a circuit training for aerobic training as well as strengthening specific muscle groups. It is so convenient to simply step into your workout area and do some simple routines as a break from your normal activities. 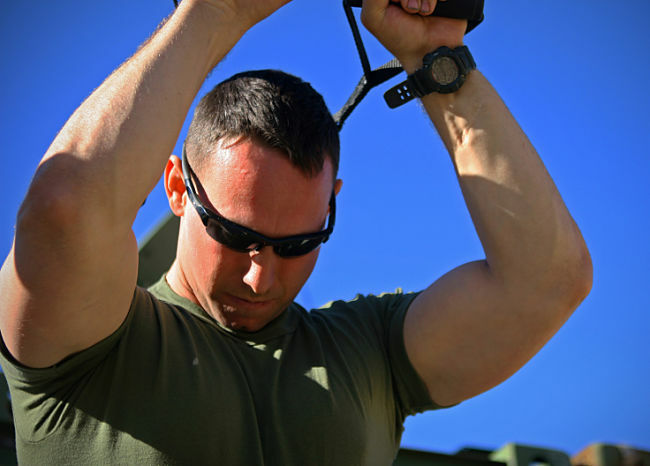 The bands are so cheap and so flexible in terms the type of exercises you can do. The resistance bands are so lightweight and compact that you can easily pack them into your luggage when you go on holiday. Also, you can have a set at work for a quick outdoor workout in the park at lunch time. Resistance bands are very adaptable and you can buy various bands of varying resistance as you progress from beginner to advanced use. Some units even allow you to fit different bands to the one set of handles. There are a large number of resistance band exercises available with lots of books and wall charts you can use to follow a set routine or develop your own. Smaller muscle groups that are hard to train with more traditional free weight exercises can be targeted with resistance tubing. This makes it particularly appealing to athletic conditioning. Sports-specific conditioning and strengthening often involves very specific training movements and exercises rather than individual or group of muscle groups. There is very little scope for varying the angle and direction of the movements with weight training or gym equipment. With resistance band exercises you can mirror the exact movement pattern you want to work on and apply varying degrees of resistance, because the bands are so versatile and can be wrapped around your body. This is one of the major reasons why they are so useful for injury prevention training and rehabilitation. While are many exercises for your limbs: shoulders and arms, and your individual legs. However stretch bands are not as suitable as weight training for the whole body and for larger body parts like your quads, glutes and hamstrings. They don't last for ever as the 'rubber' like material becomes brittle with age and breaks. However they are inexpensive to replace. Always stretch and warm up first as for any exercise routine. Always start with some tension on the band as you start the exercise – for repeats don't allow the band to go completely slack between repetitions. Instead keep some tension applied at all times. Place both feet on the band, about a shoulder-width apart. 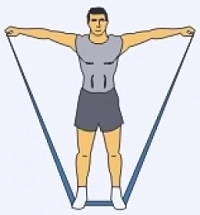 Use the handles to grab the resistance bands and apply tension the band with the hand at the level of the shoulders.Do a series of full squats while keeping the band at shoulder height. Return to the position at the start and repeat the exercise. Position the band under one foot and take step backwards with the other foot. Bend right over making sure you keep your back flat, until you each an angle of about 45 degrees Drag the resistance band upwards in the direct of your waist, while making sure you keeping your elbows tucked in close to the close body. Start a repetitive rowing motion and squeeze your shoulder blades together while you are rowing. Repeat the rowing action. Lie the resistance band on the floor and lie on top of it so that it is positioned beneath your chest Grab the handles both hands. Press one arm upwards vertically and then return to the horizontal position. Then raise the other arm vertically. Start by looping the resistance band right under your left foot. Then grab the ends with the handles. While keeping the hands together and extend both arms vertically down in the direction of your left foot. Start a chopping action by pulling the band up and away in an action that resembles chopping wood. While doing this chopping action keep your feet still and rotate your body at your trunk. Repeat this chopping on one side for many repetitions and then swap the position and repeat with the other leg. Take hold of one handle and pass the tubing behind your back and grab the other end behind your back. Raise the top arm over your head ensuring that you extend the elbow and fully extend your top arm. Bend the elbow to lower the top arm and repeat the extension for the desired number of repetitions. Repeat with the other arm. Take up a position with your feet a shoulder-width apart. Step backwards a small stride with your left leg and stand on the ball of your foot. Position the resistance band beneath tour front foot and hold the handles in each of your hands. Position yourself as shown in a staggered stance with back straight and head erect. Start by lowering your body by bending over at the knee and hip until your reach a position with the thigh parallel with the floor. Your body should assume a straight line position descending towards the floor. Then straighten the knee and hip and repeat. The swap to the other leg. Place both feet shoulder with apart onto the resistance band and bend the knees slightly. Grab both handles in your hands with palms facing each other. Position your arms so that they hang down to the side of your body with your elbows bent a little. Lift the band by extending your arms out as shown to shoulder height making sure you keep your elbows slightly bent. Return your arms to your sides and repeat the flapping motion. Stand on the resistance band with your feet a hip width apart and with your knees bent a little, and assume a slightly staggered position. Grab both ends and grab the handles with palms facing upwards and forward. Keep your arms as shown, hanging down with elbows close to the sides your body. Flexing at the elbows and do a curl bringing the hands up to the level of the shoulders. Keep your back straight and head upright facing forwards throughout the repetitions. Tension the shoulders by drawing shoulder blades together slightly. The only movement should be the arms bending at the elbow joint. Seated leg press - Sit on a chair, bench, table or step and bend your knees. Position the resistance band under one foot with the toes pointing slightly downward. Straighten your leg without locking your knees. Bend your leg once again and repeat with the other leg. Seated Rowing (Back Exercise) – Position yourself on the floor and place the resistance band around your feet with the band on the balls part of the foot. Maintaining your elbows slightly bent throughout, stretch the band by pull your arms back in a rowing action. Squeeze your shoulder blades together while rowing and repeat for the desires number of repetitions. Press with the Chest - Run the resistance band behind your back and grab both handles in front of your body. Simply press your arms forward and together. Repeat for the number of repetitions. 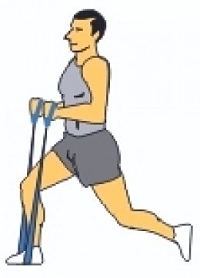 Front raises - Run the resistance band under your feet, shoulder-width apart. Then simply raise your arms until they are at shoulder height. This can be done at various angles. Biceps curls - Position your feet hip-width apart and place one end of the band beneath your foot as you hold the other end in your hand. Slowly curl your arm. Bend your elbow upward toward your shoulder. Repeat for the repetitions and change to the other arm. Triceps extensions - Place a cloth or towel around your neck. Position the resistance band on the towel behind your neck. Grab both the handles keeping your elbows close to the side of your and slowly straighten your arms. Keep your wrists straight and go back to the start and repeat.